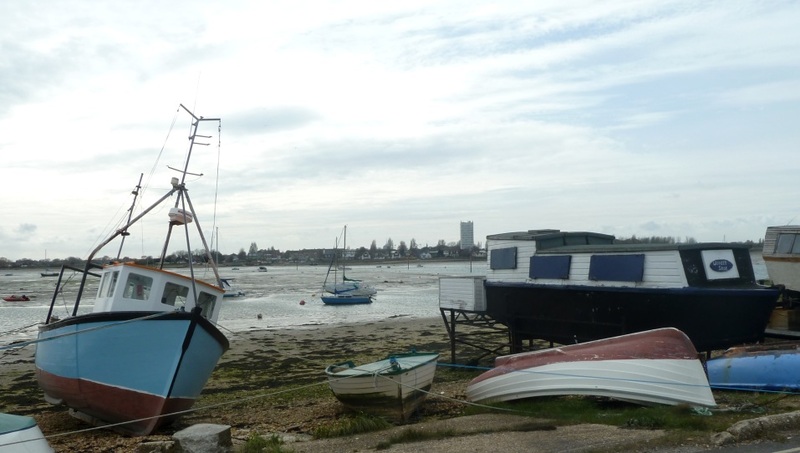 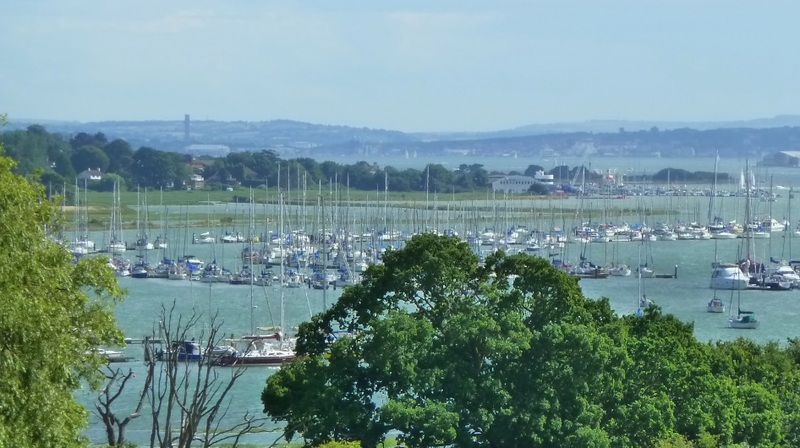 Over in a quiet corner of Portsea Island, far away from the historic dockyards of old Portsmouth, the designer shopping at Gun Wharf Quays and the seaside scene at Southsea, at the very southeast corner lies Eastney. 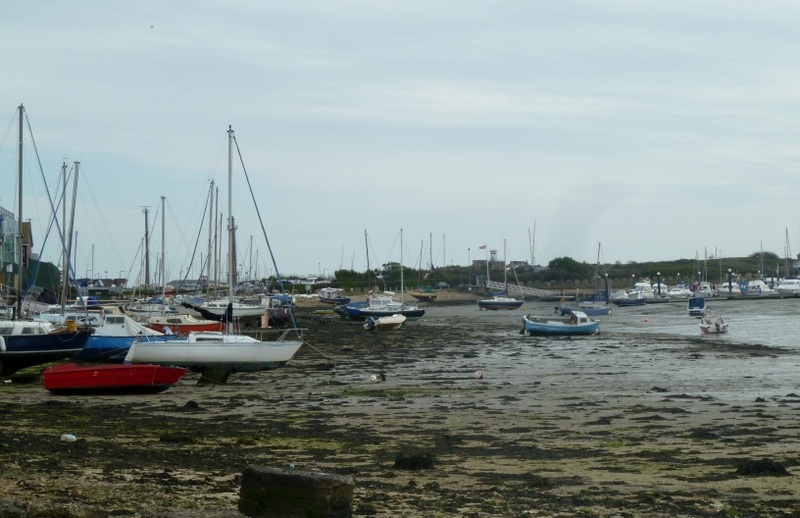 Langston harbour is shallow at the best of times, the tide runs out fast through the narrow gap between Eastney and Hayling Island leaving exposed mud flats and boats dried out to await the next high water. 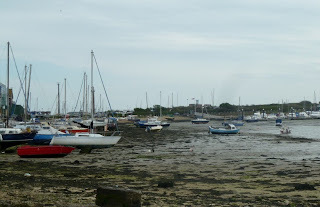 The area is a little neglected and maybe that’s part of it’s charm, with a collection of old and interesting boats, even houseboats, some propped up above the high water mark. 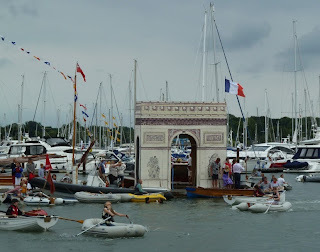 Paris came to Bursledon for the regatta on Saturday, the Elephant Boatyard waterfront was transformed with it's very own Arc de Triomph and Effiel Tower. 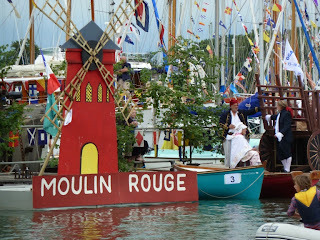 Not forgetting the Moulin Rouge. 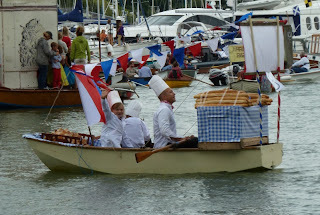 The French theme clearly continued across to the catering, as is indicated by the serious interest in the food. 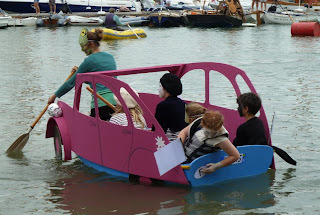 The dinghy parade was no less authentic, what French themed water carnival would be complete without a 2CV. 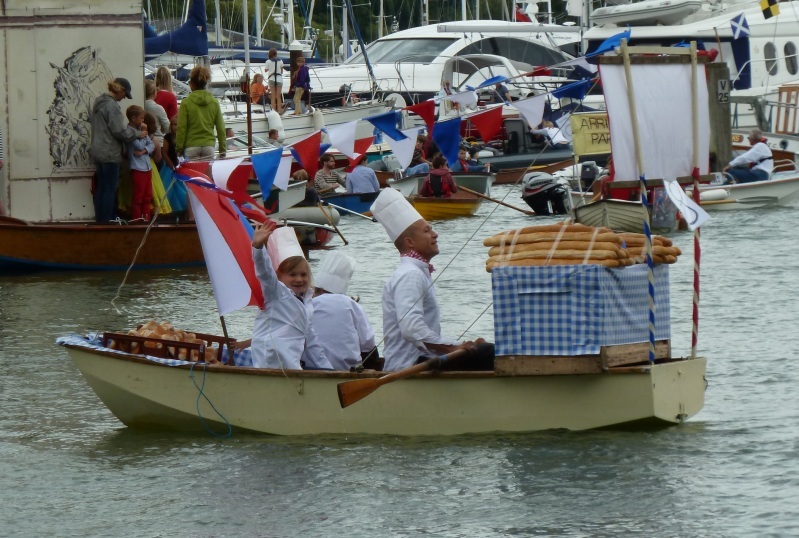 And fresh bread delivered directly a votre bateau Monsieur. 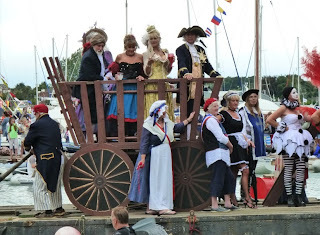 Meanwhile some local aristocracy await their fate at the hands of la revolution. 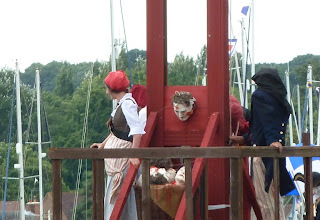 As Madame la Guillotine performed her grizzly work to the appreciation of the crowds. Of course there were some sailing and rowing races, but all in all they were much less interesting. 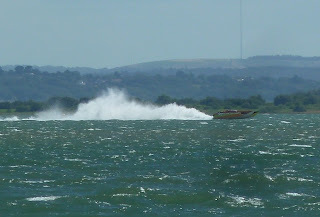 A great day was had ending in the usual firework display. 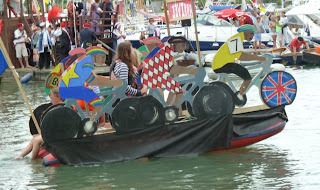 As always thanks to the organisers, sponsors and especially the Elephant Boatyard. 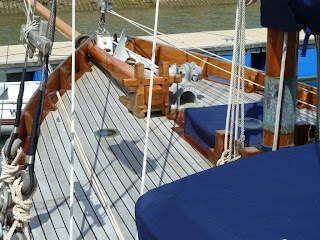 We've passed by Onward of ITO a few times but never had the opportunity for a close look until last weekend. 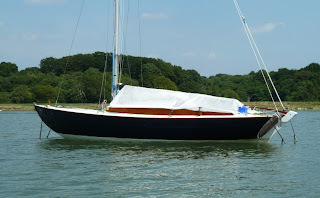 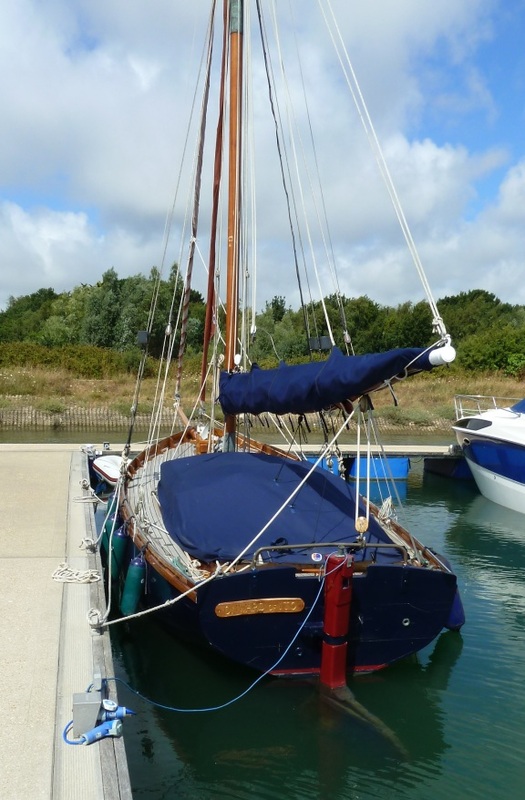 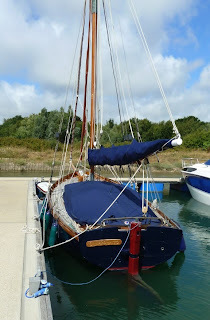 She's an Itchen Ferry, restored in 2000 by Traditional Sail. The curious name "Onward of ITO" apparently comes from the first owner one Alfred Parker, landlord of the Marsh Tavern who was known as ITO. 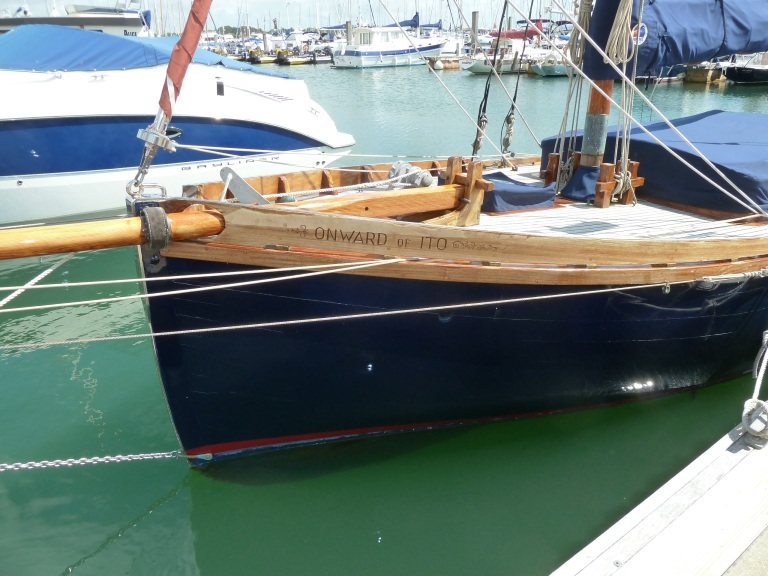 Originally built in 1923 by W Mollett of Southampton, Onward appears to have spent most of her life as a yacht rather than a working boat. The Itchen Ferry is a local working boat of the Solent, the first examples were built on the River Itchen in the 18th century, the most famous builder was Dan Hatcher. 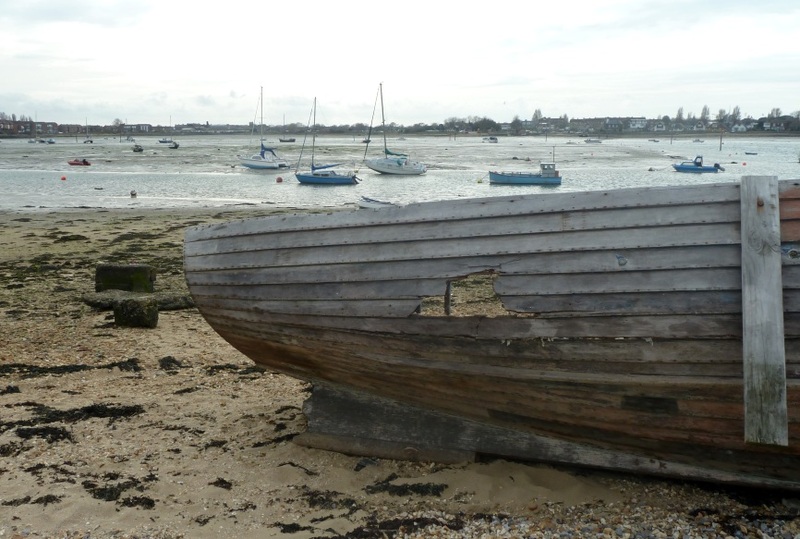 An Itchen Ferry association was formed in 2011, with some great details about the history and the surviving boats. 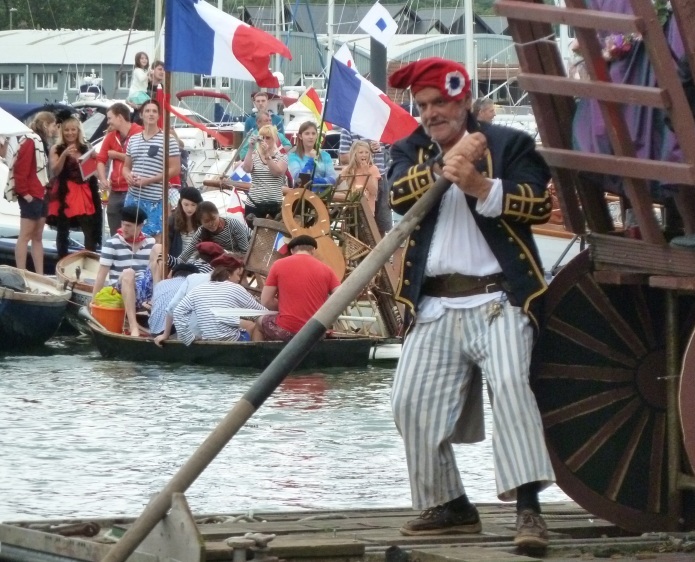 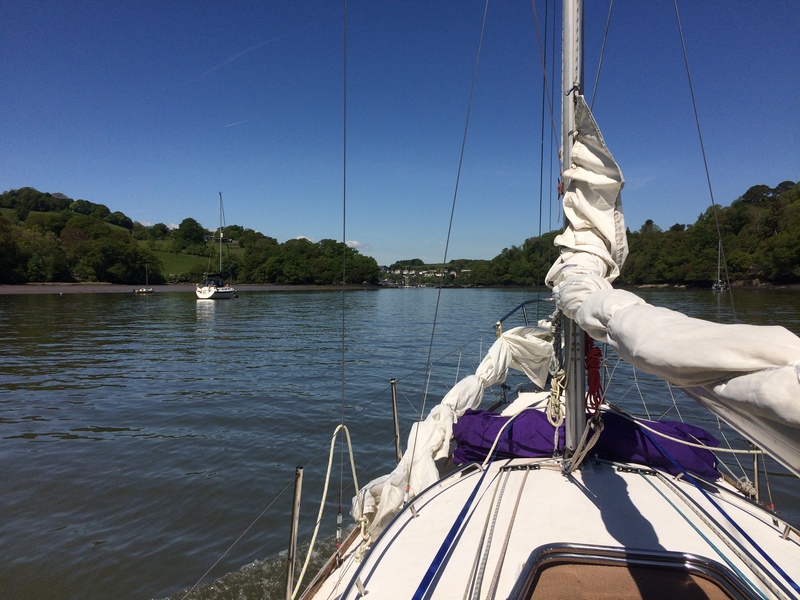 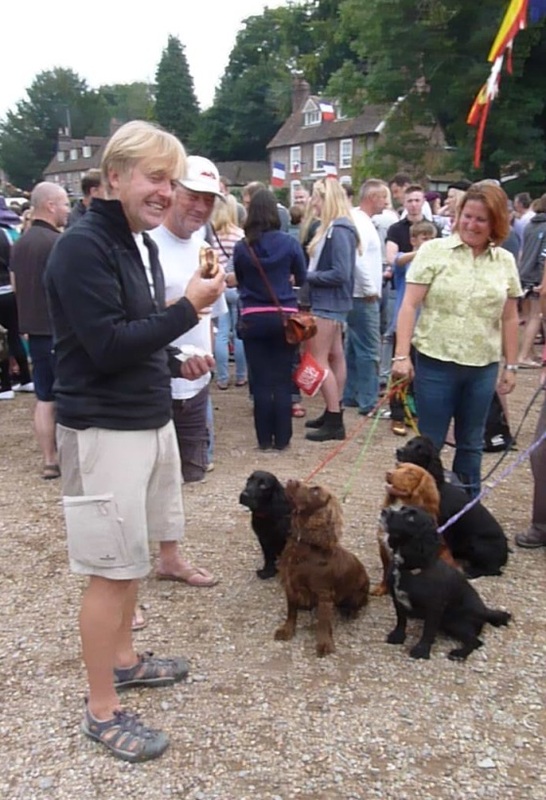 Come on down to Bursledon next weekend for the annual regatta. This year's theme is "Parisian" which should lend a cosmopolitan feel to Bursledon pool and the Elephant Boatyard, not to mention Le Jolie Marin. For a preview of what's on offer here's a clip of last year's regatta, fast forward past the first two and a half minutes of gig racing to see the famous floating London bus. 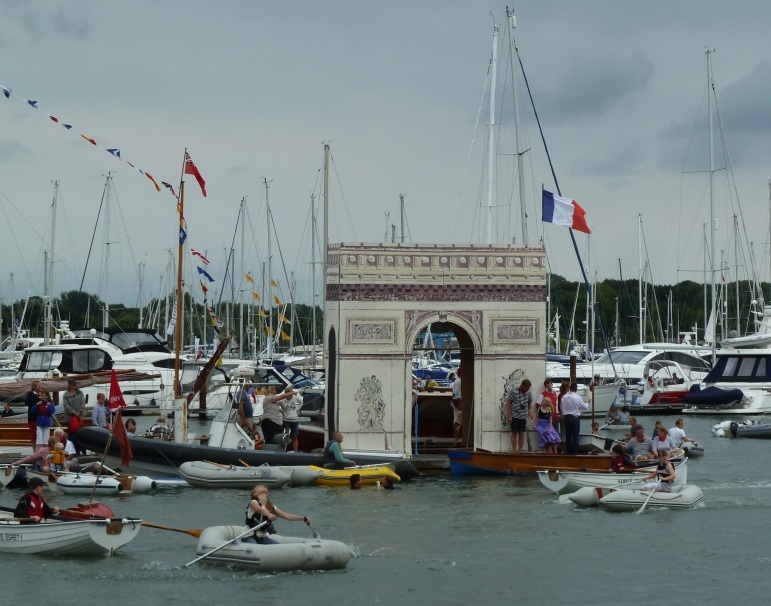 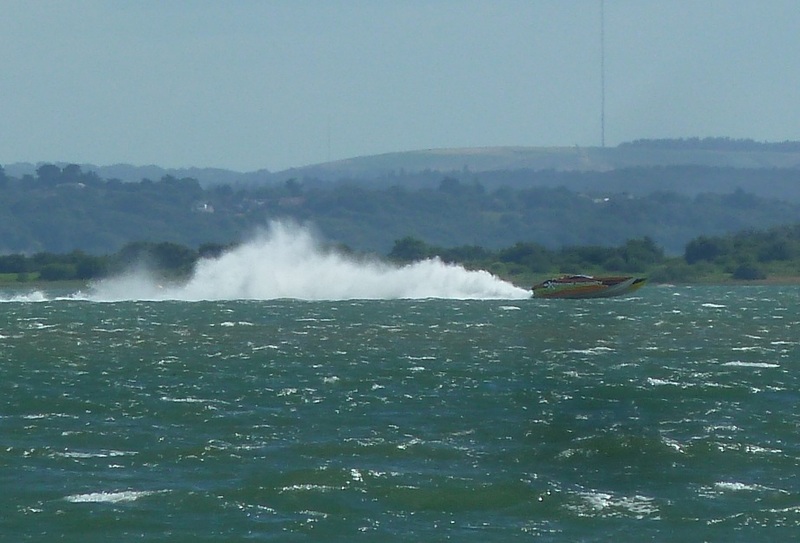 Dinghy racing takes place from Lands End hard on Saturday morning, (come along and cheer for the yellow Cormorant), the main events take place from 12.00 to 18.00 in the pool at Bursledon with highspot - the water carnival at 15.30. The torch light dinghy parade take place after dark at 20.45. 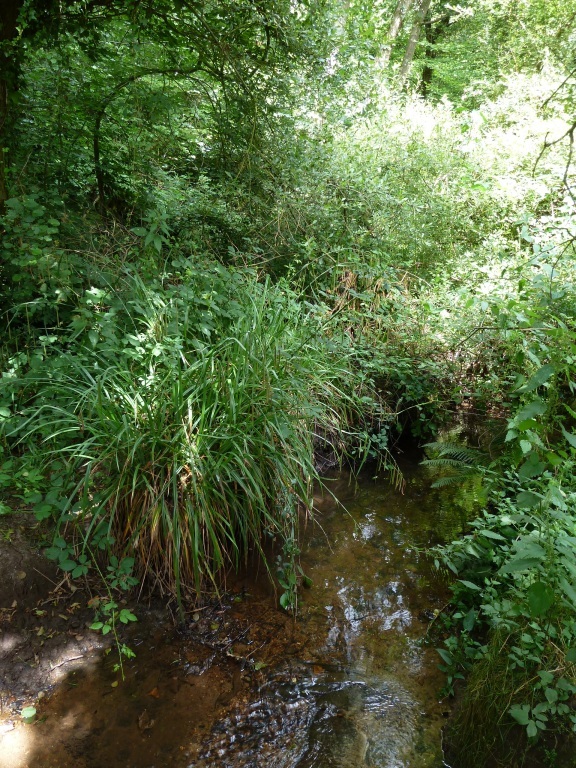 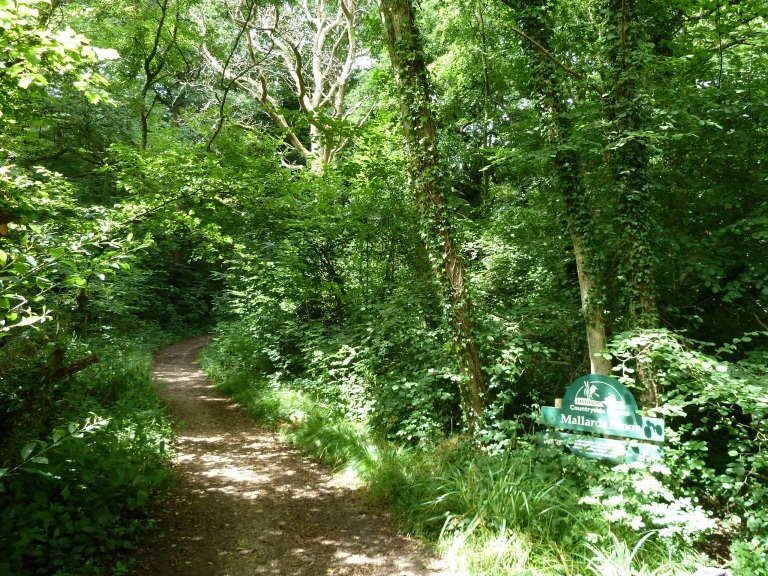 The route goes through some great places starting in old Bursledon above Hacketts Marsh, down to Hungerford Bottom, passing through Mallards Moor, and Badnam Copse before coming out into Satchell Lane. My favourite spot was Mallards Moor curiously titled as it's more of a wood with a stream running down to the river, but fantastic with cool dappled sunlight coming through the leaves and the damp atmosphere around the stream, an ideal resting spot on a hot summer's day. 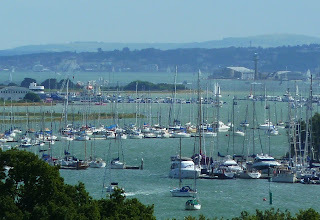 I took the header photo nearly 10 years ago, having just bought a digital camera I pretty much pointed it at anything and everything and was amazed at the detail from the boats in the river right across to buildings in Cowes. 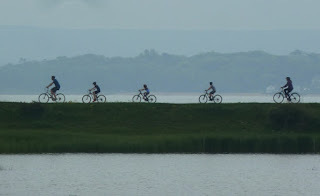 I couldn't quite remember where I'd taken it from, so while I was cycling along the road above Hackett's Marsh the other day decided to see if I could recreate it. 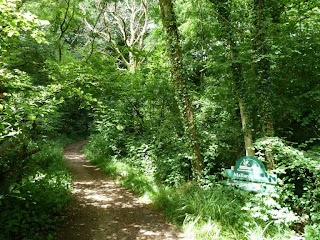 The first problem was that the trees had grown a bit during the interval and being summer were thick with leaves. That said the top picture shows Warsash , the black and white striped building is the harbour office, to the right of the picture is the aircraft hanger and the old coastguard tower at Calshott on the other side of Southampton water and away in the distance Cowes where you can see the Red funnel ferry. 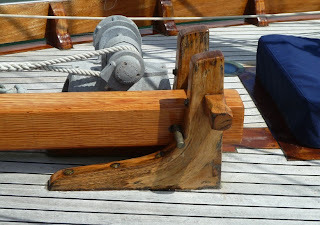 This seems like a fitting post as the page hit counter is approaching 350,000, thanks for stopping by. Hamble Point on a summer Saturday afternoon is a good place to watch the cruise ships departing from Southampton docks as they make their way down Southampton water and navigate the twisting channel around Calshot and the Bramble Bank. 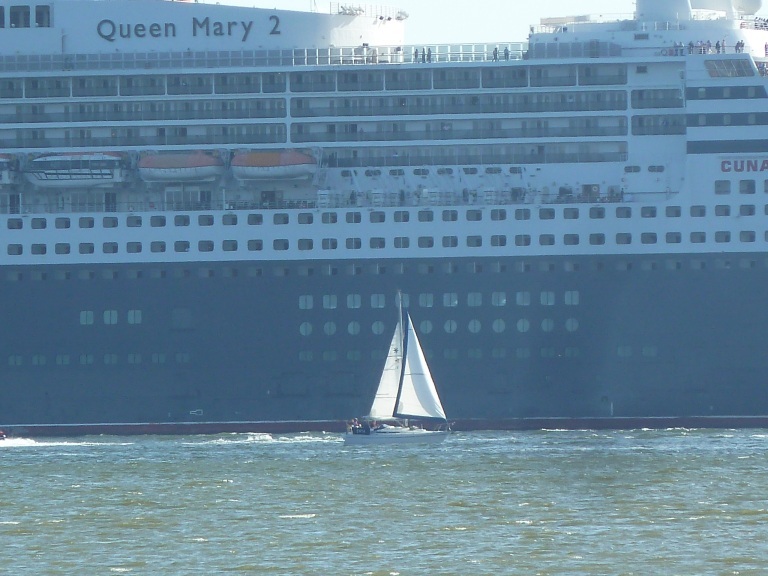 The stand out vessel among the white "block of flats" which make up the cruise ship fleet is the Queen Mary 2 with a style which harks back to the hey day of cruise liners despite her recent launch. 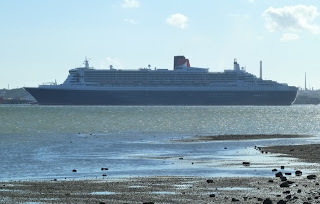 Navigating the Solent can be difficult at the best of time, these big ships have a mobile exclusion zone 1000 meters forward and 100 meters on either side. 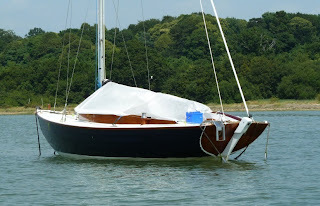 I've always admired folkboats, but this example really is something special. 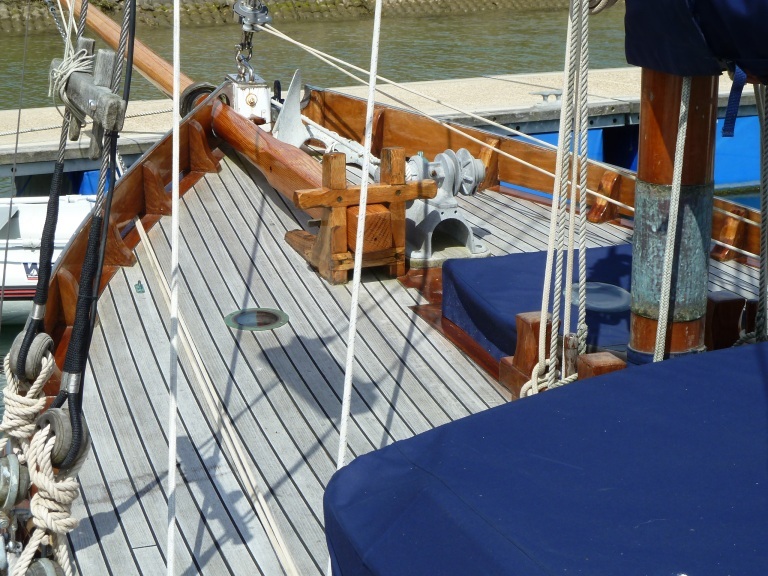 Sadly the cover obscures the cabin detail which has varnished teak sides and a white top (is that roof?). Navy blue hull, white deck and varnished coamings is just about my favourite colour scheme, but look at that detail around the stern, with the plank ends picked out in contrasting white between the blue and the varnished transom. I don't know if there's a Concours d'Elegance, but this boat deserves the title and being a folkboat sails like a witch, best of both worlds. 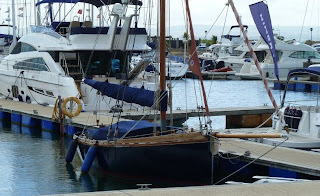 I'm a life long sailor, but I just can't help being drawn to the "dark side" AKA motorboats. 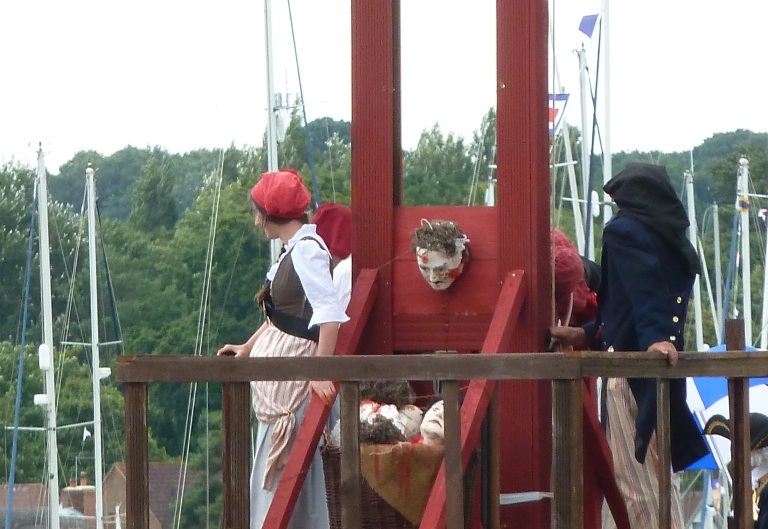 To be honest who wouldn't be?